UMUSTBEBORED: GODZILLA (2014) A Beast to be Feared and Loved! Gareth Edwards and all involved in the making of this film have given us a truly remarkable GODZILLA movie! I am a big fan of the GODZILLA franchise so my review will be a bit too over glowing. The past films were a part of my mental development as a young child. Godzilla and all the monsters he fought were a source of inspiration for my wild imagination. I colored and drew many pictures of him/her in grade school. Often I would glue many pages of notebook paper together so I could draw him as big as I could fighting the giant Sea Monster or Ghidorah the Three-Headed Dragon from space. There would always be planes, ships and helicopters buzzing about shooting, getting blown up or having pilots ejecting as their craft crashed into the massive beast. Good times. I wasn't into sports in case you were wondering. As much as I love Godzilla I will admit that I haven't seen most of his films. My favorite though was GODZILLA 1985. If I remember correctly it was the first film since the original that had a more serious tone. The death of people wasn't so easily brushed aside like most movies in the franchise. Charred bodies were left behind in his destruction. Buildings were no longer just mere models on a stage with a rubber suit monster stepping on them with fire crackers being shot from toy tanks at her. The new GODZILLA is closer to that 1985 movie than any other. 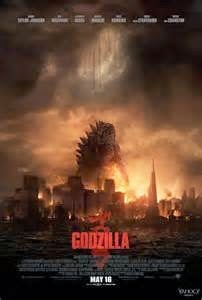 I have waited a long time for a Godzilla movie like this. GODZILLA is a film with surprises. I had a few expectations as the film began with how the existence of Godzilla would occur. They set up a massive find in a mining dig that I thought for sure was a baby Godzilla hibernating in an egg. When that egg hatched however something totally different came out of it. It was a giant space bug called the M.O.T.U. I do believe that is an acronym for Giant Bug From Space or something like that. I forget. The point is I didn't think a Godzilla film could trick me but this one did. Also who lives and who dies in terms of human characters was a bit surprising as well. I won't spoil that. This film has made Godzilla something to be feared. He is a large animal that has been here longer than the dinosaurs and this planet is his territory. That fact puts things in perspective for our human characters. We are the insects to him/her. When large alien monsters show up on his territory Godzilla goes out for the hunt. All humans can really do is get out of the way. Of course this is a movie so we do have to have a human character running around observing the carnage and trying to help but really just kind of making things worse. This human character also has a wife and a child so the movie can show scenes of them to fill out the movie's running time. Godzilla is the hero. Even though he is an animal he has the look of intelligence to his face. You can see him thinking and reacting to the battle before him with the giant bug thingys and being aware of the people around him. Still if he saves anyone it is by shear accident. He is just defending his territory. Yeah, it looked like he was intentionally saving those kids on the bus from friendly fire but really he was just standing up. It is best just to stay away from him. Don't try to make friends with him otherwise you might end up like the ship Captain from GODZILLA 1985. If I remember correctly he tried to friend Godzilla and ended up burnt to a crisp. Whoops. Still we root for him when he hunts the alien bugs and we feel sorry for him when a building falls on him hurting him in the process. How do like that? What happened to the cardboard models that did nothing but get stepped on and explode? The best thing about this movie besides Godzilla is the mix of down to earth reality with campy large giant monster hyper-realism. The people moments feel just as real and genuine as the giant monsters battling for dominance do. We have people staring wide eyed out their windows as we see in the reflection actual monsters moving about destroying the world around them. It looks real even though we know it isn't. The movie builds up moments with great skill and delivers the goods when the moments are right just like the old big Speilberg movies use to do back in the day. The whole movie is like that saving the best fight till the end. There is a connection that comes across naturally with the small world of humans peering at the large universe of Godzilla. The scope and grand scale of all the is happening is maintained almost perfectly. There is a big explosion at the end that probably would have done more damage than what the film lets on. In the 1998 GODZILLA there was no connection no matter how forced. They tried too hard to make us believe that our characters occupied the same space as the giant lizard with scenes of cars ramping off Godzilla's foot and having some guy almost get stepped on by Godzilla. These moments are forced onto the audience as "Big Blockbuster Movie Scenes" that are required to be put into a film to thrill the audience like a roller coaster ride. Going forward in order to keep the Godzilla movies working the creators need to work on the designs of the monsters Godzilla will be fighting. That is my only real complaint about the new GODZILLA. M.O.T.U. is a generic forgettable creature design. I fear that the need to keep the look of Godzilla's world realistic will reduce the look of the monsters to uninspired creations that hold no iconic value like the original Godzilla foes from the Japanese films did. We need a three headed space dragon from Planet X to come down and force us to believe that such a creature can exist in our reality. Make them more colorful with crazy abilities. Don't make the same mistake all the TRANSFORMERS movies made. All the Transformers look exactly the same. None are memorable and all are hard to tell who is who when they fight each other or walk around casually. Please new GODZILLA, take a page from PACIFIC RIM. All the monsters in PACIFIC RIM are easily distinguishable from one another. That is how it should be. And as a bonus you would sell more action figures that way too. Just saying.